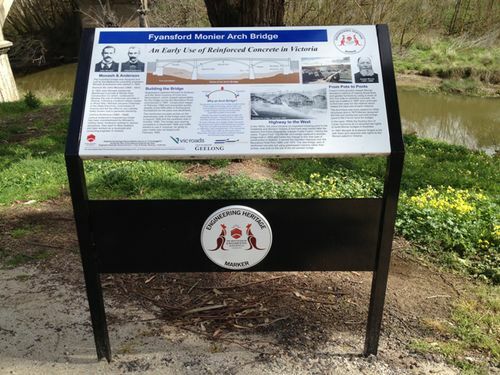 Engineering Heritage Marker recognises the Fyansford Monier Arch Bridge as a site of engineering historical significance. The Fyansford Bridge was one of the first Monier reinforced concrete bridges built in Victoria and therefore represents a significant change in the materials and methods used for building road bridges. The Fyansford Bridge was built by Melbourne consulting engineers, Monash & Anderson who started their practice in 1894. Negotiations with the Shire Councils of Corio and Bannockburn, which shared responsibility for the bridge across the Moorabool River at Fyansford, commenced in 1897. Construction began in 1899 and proceeded quickly despite some difficulties in finding good foundations for the piers and abutments. The reinforced concrete arches on the downstream side were cast in August 1899 and the upstream side in October 1899. The bridge was approaching completion in December 1899 and traffic started to use it; however, it was not tested until February 1900. The bridge carried the Hamilton Highway over the Moorabool River from 1899 until 1970. A new bridge was then built to carry an increased traffic flow; made of reinforced concrete but used precast girders rather than arches. The Fyansford Bridge is still in use, carrying pedestrian and bicycle traffic.